The final piece of this puzzle is what impact the Charter and choice movement continues have. Check this table out. It shows the number of CSD resident students enrolled in charter schools and how much funding gets passed through the District to Charters each year. 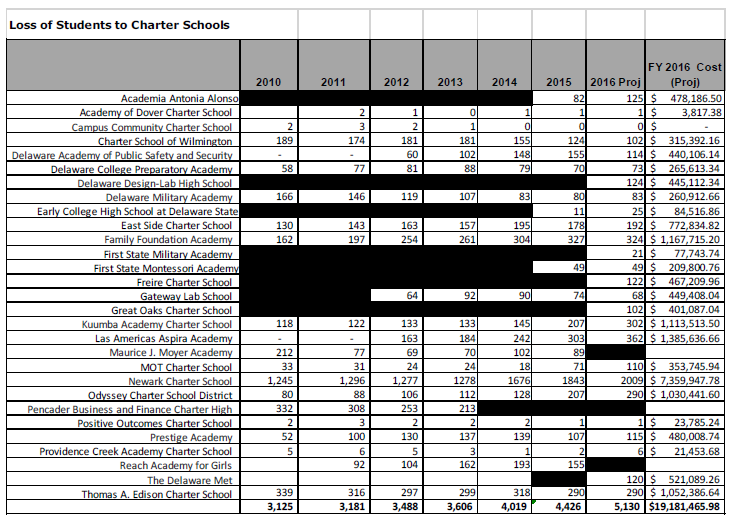 Right off the bat this year, CSD is projected to pay out $21,000,000 to Charters and choice. (Yes, that $19 million projection has gone UP). 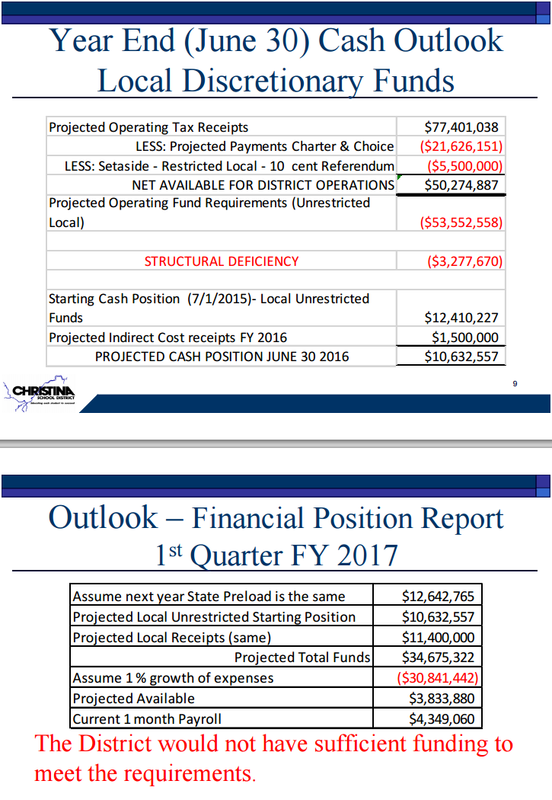 Since charters lag a year behind on funding, they won’t feel the brunt of the failed referenda and reduced funding until next fiscal year, meanwhile Christina is feeling it in real time and has to manage it RIGHT NOW! $21 million is unprecedented. How is this District going to respond? It can’t just sit around for another year because come June 30, 2016, CSD will not have enough cash in reserves to meet State code requirements going into next school year. By law, each school district must have enough cash in reserve to meet 1 month’s worth of payroll (typically September’s) while the bulk of the taxes are being collected. The current 1 month payroll total for CSD is $4,349,060. By this time next year when the District and Board of Education is required to inform the State that they have enough cash to meet the 1 month payroll payout, CSD will not be able to advise the Board that enough cash exists. This is the brick wall many of us have seen coming for the last 3+ years. The Board and District cannot sit on their hands any longer. Changes have to be made and we need to start making them now. Right now. That’s it for right now folks. Tomorrow night’s Board of Education meeting is going to be very, very interesting for reasons that go beyond the budget and the budget is a hugely important. Questions? Throw ’em at me. Thank you for all this, Brian. CSD also has students choice to other districts, right (esp Red Clay)? And a small # of students choice-in to CSD from elsewhere. Do you have those numbers too?! The Board has no say in how much money goes to Charters. Charters are public schools. If a student residing in Christina attends a charter the District is required to send the funding it would have spent on the student if they stayed in District with them to the Charter. Absolutely correct about finances not being CSDs only issue, but most other issues are interrelated with finances. I understand CSD does not determine or have input in the money that goes to the charter for each student. My point is what CSD doing to stem the tide on students leaving? Clearly for ever student that leaves the ‘overhead cost’ is spread among the remaining students. Well that’s a great point of contention right now. Many feel the district lacks any distinct vision of where it wants to go in the future. Financial limitations aside, CSD has been stagnating for years and until that changes things will continue to be difficult. There are options right now that could be undertaken by the Board and District administration but the key word is ‘and’. The Admin and Board are disunified and dysfunctional that that has to do a complete 180 for things to begin an upward trend. Last nights (Aug 11) certainly demonstrated the dysfunctional aspects of the Board. Almost embarrassing. I feel so bad for the true workers in the district (educators and staff).